Hello Friends. I am Robin Quiroga and I am the Sponsorship Program Implementation Facilitator here in Cochabamba, Bolivia. I want to share with you my experience working with the sponsorship program of School Health and Nutrition in one of our schools. First, Save the Children provided children with dental hygiene kits, comprised of toothpaste, a toothbrush, and a water cup. We also joined with parents in requesting the help of the Faculty of Dentistry, from the University of San Simon, to teach children proper dental hygiene. This effort turned into a "Dental Hygiene Campaign" during which 50 students from the Faculty of Dentistry helped in training children from pre-school up to sixth grade on dental hygiene, brushing techniques, prevention, and dental care. They did this using participatory and hands-on methodologies, such as theater sketches, puppet shows, paintings, and games. 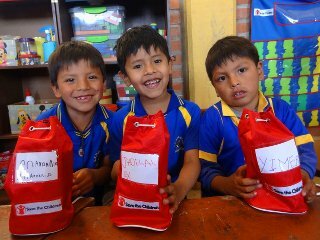 Additionally, children practiced brushing their teeth in their classrooms, using their new dental hygiene kits. Faculty of Dentistry students even performed teeth cleanings, with fluoride, in order to prevent cavities. All in all, this was a fun day for children who were excited to learn how to care for their teeth. Some had never visited the dentist and for them, this was an extra special experience. School teachers were very happy and grateful to Save the Children and the students of the University of San Simon for working together to improve dental hygiene for so many children. This effort reminded me, once again, of the importance of coordinating our activities with parents and other partners, and of the successes we can achieve by doing so! How old were you when you learned proper brushing techniques? Who taught you? Consider how difficult keeping your mouth feeling clean and healthy must be if your family could not afford a toothbrush! In honor of the generosity and time of the University of San Simon dentistry students, we ask you to consider an extra special donation to support more clean mouths and happy children!